The consensus of recent literature is that both the Greenland and Antarctic ice sheets have “tipping points,” where exceeding certain climate thresholds can lead to feedbacks that result in sustained loss of ice-sheet mass, if global warming from human causes were to exceed 1.5 °C above pre-industrial temperatures. While these thresholds may be exceeded even if global mean warming remains below 1.5 °C, simulations of both ice sheets indicate that the risks may be significantly lower. The Paris Climate Agreement, signed by 195 countries in December 2015, raised scientific questions about the relative importance of maintaining mean global warming below 1.5 °C as compared with 2 °C. 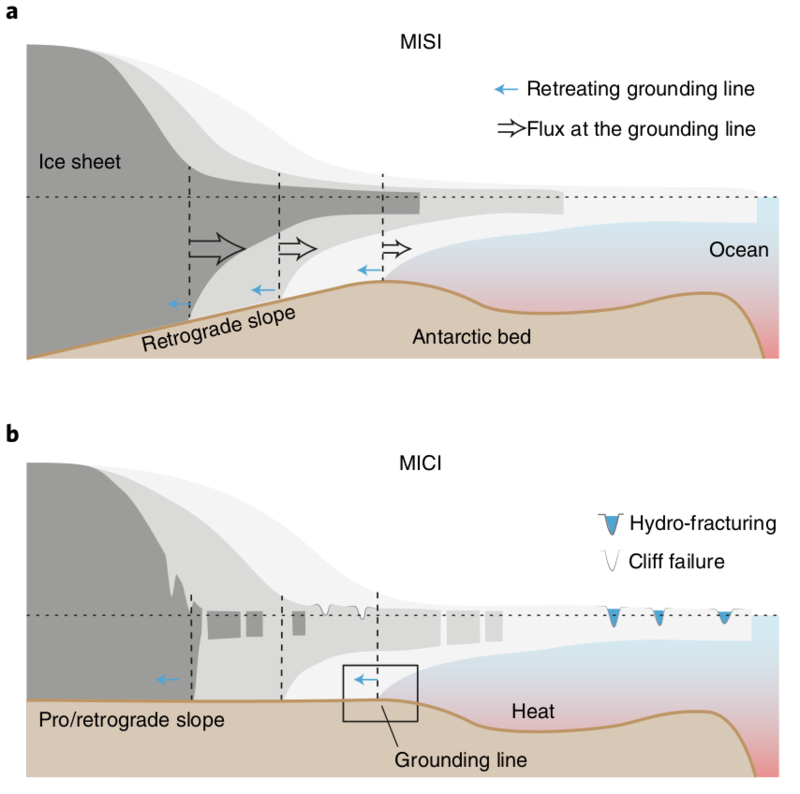 This work draws on recent literature from the ice-sheet modeling and observing community to conclude that there would likely be a significant benefit for mitigating future sea-level rise if global warming were not allowed to exceed 1.5 °C. Even if global warming from human causes were constrained to less than 2 °C above pre-industrial, the Greenland and Antarctic ice sheets will continue to lose mass throughout the 21st century at rates similar to today. Nonlinear feedbacks resulting from changes in the atmosphere (for Greenland) or the ocean (for Antarctic) could trigger significantly larger rates of mass loss. Furthermore, large uncertainties remain in future projections of polar climate and the ice-sheet response. On millennial timescales, both ice sheets have tipping points at or slightly above the 1.5–2.0 °C threshold; for Greenland, this may lead to irreversible mass loss due to feedbacks between snow accumulation or surface melting and the elevation of the ice sheet, whereas major Antarctica drainage basins could collapse due to ice-shelf weakening. Pattyn, F, C Ritz, E Hanna, X Asay-Davis, R DeConto, G Durand, L Favier, X Fettweis, H Goelzer, N Golledge, P Kuipers Munneke, JT Lenaerts, S Nowicki, AJ Payne, A Robinson, H Seroussi, L Trusel, and M van den Broeke. 2018. "The Greenland and Antarctic Ice Sheets Under 1.5 °C Global Warming." Nature Climate Change, doi:10.1038/s41558-018-0305-8.